Just after posting Why Did Luke Replace the Anointing of Jesus at Bethany with the Sinner Woman Washing His Feet? I came across a similar explanation for why Luke removed Mark’s episode of Jesus cursing the fig tree and replaced it with a far more merciful one. 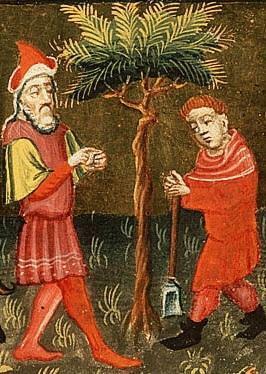 By sandwiching his story on either side of the Cleansing account, Mark indicates that he wishes the fate of the unfruitful tree to be seen as a proleptic sign prefiguring the destruction of the Temple cultus. The Markan import of the story, therefore, is both eschatological and symbolic. The harsh import of Mark’s story was recognized by Luke who decided to omit it. The third evangelist replaced the pericope with a characteristic lament for Jerusalem and earlier has Jesus recount a parable of a barren fig-tree to which a period of grace was granted. The Lukan parable intimates that in Jesus’ ministry a time for repentance was offered to Israel and its Holy City. An allegorical tendency is hence discerned in Luke, in keeping with his view of salvation history. Once again, “Luke” evidently did not think he was reading historical memories or traditions about Jesus worthy of preservation and felt at liberty to create a quite different story to teach what he believed to be a more appropriate lesson. 12 On the following day, when they came from Bethany, he was hungry. 13 And seeing in the distance a fig tree in leaf, he went to see if he could find anything on it. When he came to it, he found nothing but leaves, for it was not the season for figs. 14 And he said to it, “May no one ever eat fruit from you again.” And his disciples heard it. . . .
As you will recall, many scholars think of Luke as a historian and a biographer. The preamble to his gospel, they insist, shows how much he cared about his many sources. Well, perhaps. But we see here that he was quite comfortable with inventing stories, freely repurposing and reusing his sources for his own needs.